By now we’re all familiar with the scientific evidence that shows just how beneficial yoga and meditation is for our health. But it’s especially important at airports. At airports, we’re often stressed both physically and mentally. The new 700-square-foot yoga space at Hong Kong Airport is fittingly called “The Sanctuary.” It’s divided into two zones. The Body Sanctuary is for yoga, and the Mind Sanctuary is for meditation. In addition to a secluded space for self-practice, it also offered gentle yoga and seated stretching through guided videos led by yoga teachers. 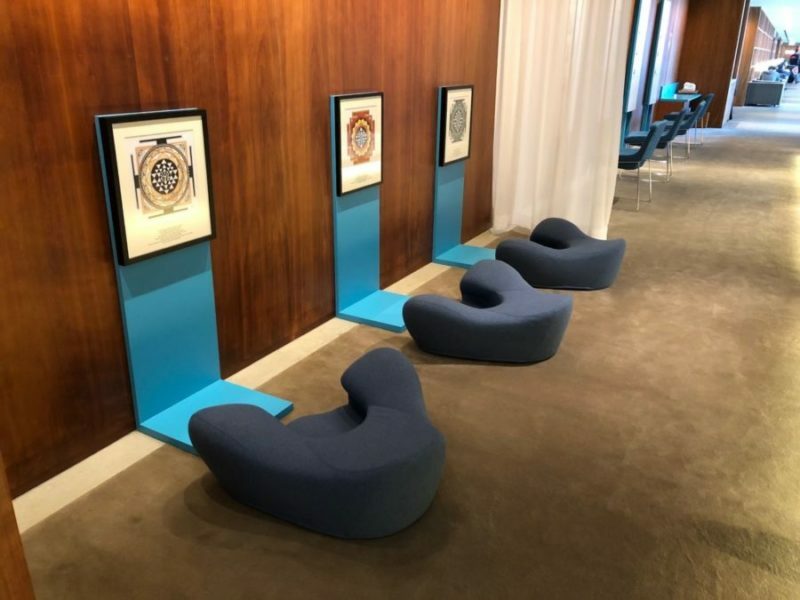 You can practice two types of meditation in The Mind Sanctuary, and they offer very comfortable seating throughout this beautifully designed space. What is The Body Sanctuary? The Body Sanctuary provides travelers with space for gentle yoga with guided videos led by Pure Yoga teachers. There’s also a secluded space for self-practice. Seated stretching is an alternative option; chairs overlook instructions on how to stretch different parts of the body while seated. The exercises improve circulation, enhance joint mobility and relax the mind for a comfortable and restful journey. What is The Mind Sanctuary? The Mind Sanctuary offers two types of meditation: audio and gazing. The space features four cushioned pods equipped with noise-canceling headphones and iPads, and travelers can listen to guided meditation sessions narrated by Pure Yoga’s expert teachers. Comfortable ergonomic cushions overlook graphics placed on the wall ahead. This area facilitates what’s called Trataka yoga practice where you can sit comfortably for a while and get lost in beautiful visuals. We all know that being cooped up in a plane even just for an hour or two can be utterly exhausting, and the stress of lines and delays can wreak havoc on our nerves. The new yoga space at Hong Kong Airport offers many physical and mental benefits to weary travelers. Yoga is great to practice before or after a long flight to stretch out sore muscles or prepare for long periods of sitting. The range of meditation options offers a chance to get into a better headspace and support our long-term mental health goals. Let us know if you’ve visited the new yoga space at Hong Kong Airport. What did you think? Tag us using our hashtag #ITravelWell to share your healthy travel expertise!